I LOVE building things out of cardboard boxes with my son! This was such a creative experience and although it took a few hours to make, that was a big part of the fun! 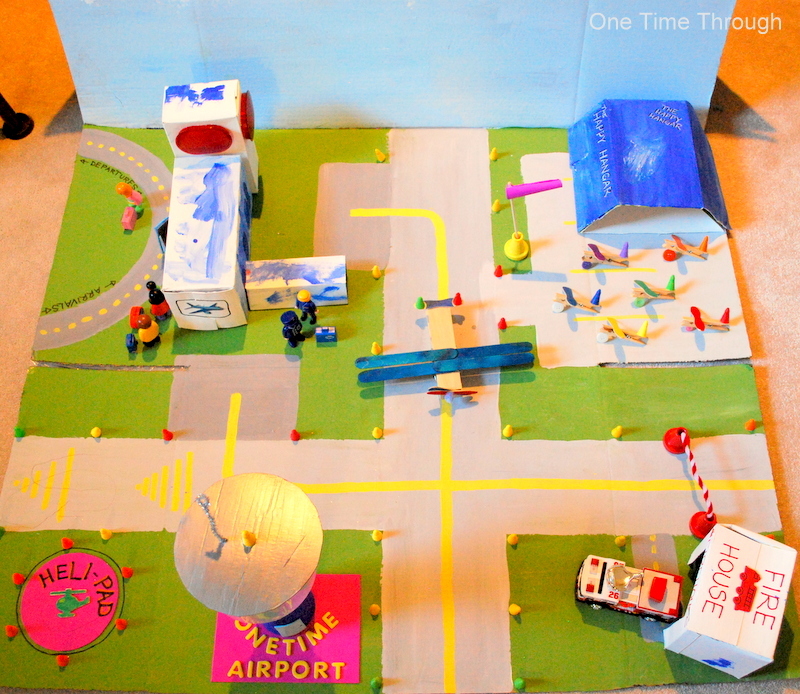 It should also be said that Onetime has enjoyed playing with the completed airport for much longer than it took to build it. First you will need to flatten out the moving box. You should have 4 sections. 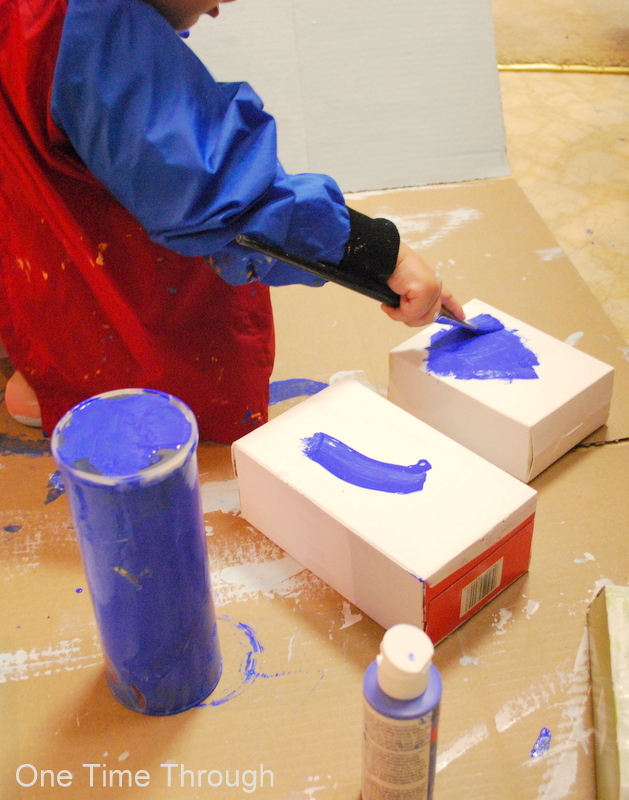 Fold two of the sections into a “mountain” so that the “sky” will stay propped up. 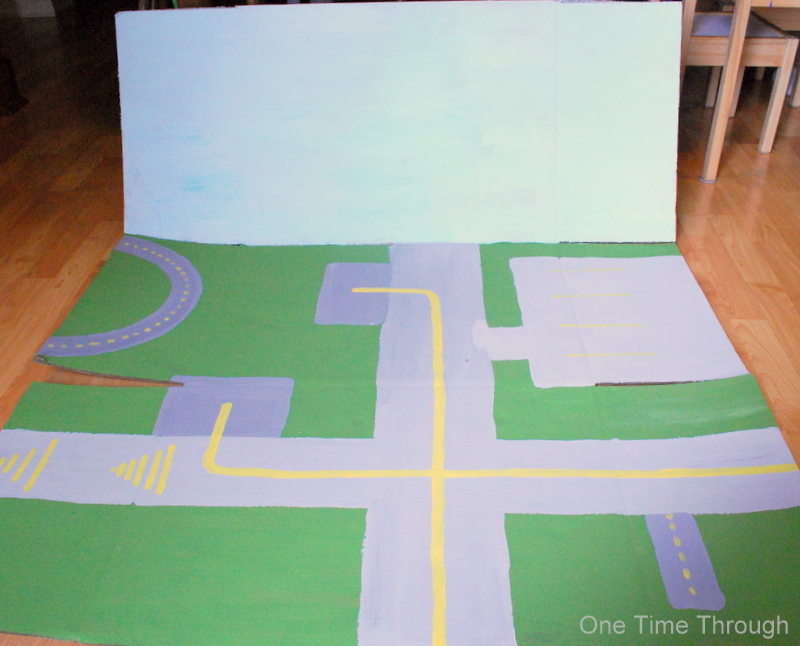 Use the acrylic paints to paint the sky and grass/runways. To make the clouds that you see later, we dabbed a sea sponge in white paint and blotted it on in cloud shapes. Onetime helped me paint the sky and the grass. When he was napping, I finished the runways and parking lots. Next, we went on a hunt around the house for boxes that could represent the different buildings at an airport. We have been obsessively reading Richard Scarry’s A Day at the Airport (Pictureback(R)) so we used that as a reference. We found a pop case for the terminal, a pringles can for the control tower, an empty cracker box for an airport fire station (also an obsession for my son), and a paper towel roll for a radar tower. I painted them all white to start to cover up the labels, but you wouldn’t need to be as picky as me. Onetime then had fun choosing his colours and adding his touches to all the buildings. To make the control tower, we hot-glued an empty DVD container on top of the Pringles can and then cut out a cardboard circle to be the roof. Later we added some game pieces as lights and a shiny silver pipe cleaner as an antenna (Onetime’s idea!). 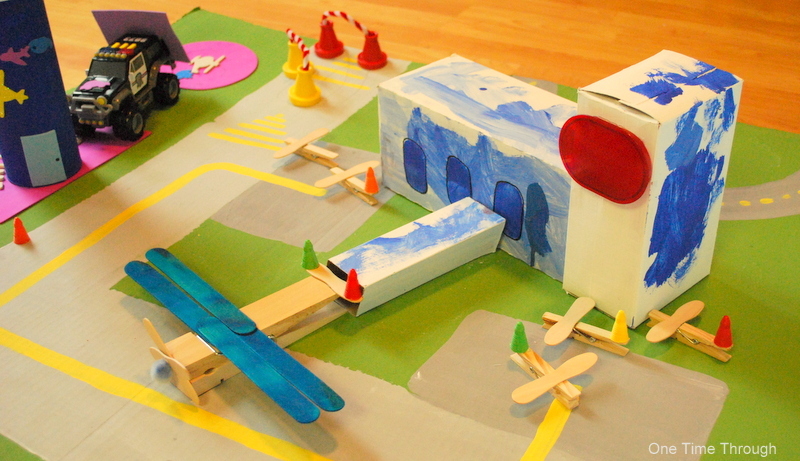 When all the buildings were dry, we placed them on the airport playboard and started adding details. 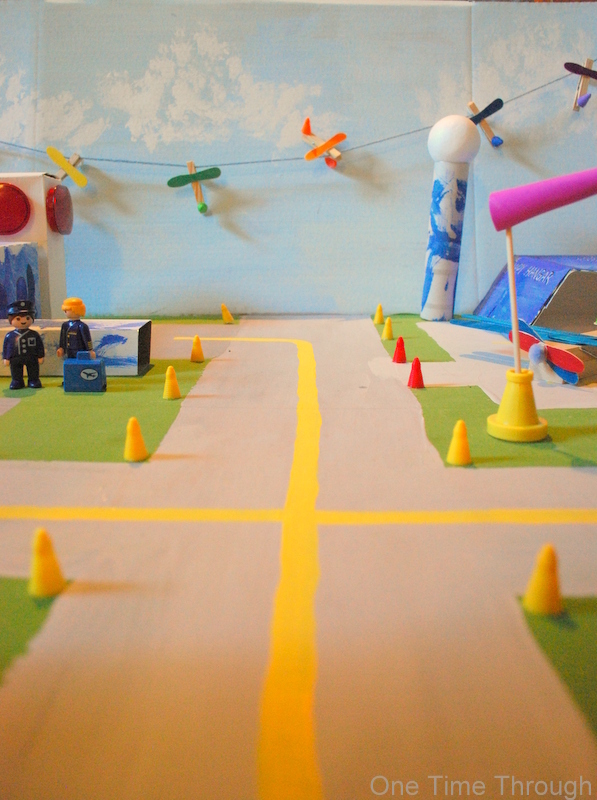 We glued the conical gamepieces along the runways for lights, and created gates with pipecleaners and cones. Onetime enjoyed putting airplane/helicopter stickers all over the place. I think they look cute! We also added the airport’s name and a helipad for helicopters to land. Although I had ideas of my own, I really followed Onetime’s lead on where things were going to go because I really wanted this experience to build his creativity. By putting out all the odds and ends that I had gathered up for decorations, Onetime was able to choose where things went and how they were decorated. He definitely surprised me by starting to use the game pieces not only as lights, but also as little people to ride on his planes! 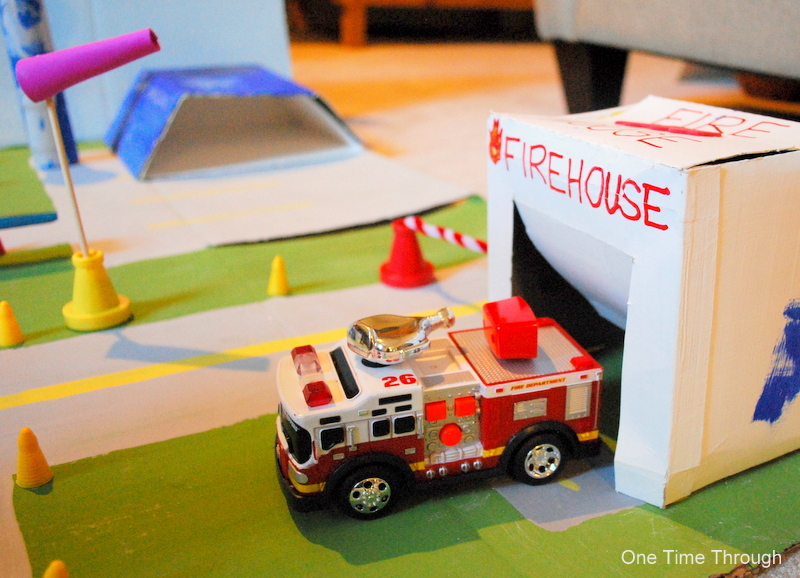 To make the airport fire station, we cut a flexible door into one side of the cracker box – big enough to fit Onetime’s favourite firetruck. I also labelled many of the buildings as we created – just for extra language learning! Onetime wanted a windsock, so I folded a piece of fun foam into a conical shape and glued it to a wooden stick. We used playdough to hold the stick inside the cone. To make the terminal, we put two boxes together and cut doors in one side that would open and shut. On the back of the terminal, we attached the toothpaste box with a pushpin so that it could rotate between the two airplane parking lots to allow passengers to move from the terminal into the planes. You can see in the picture that Onetime lined the walkway up with his plane for loading! Although I don’t think that people would really appreciate going into the rear end of a plane, I didn’t tell him that! 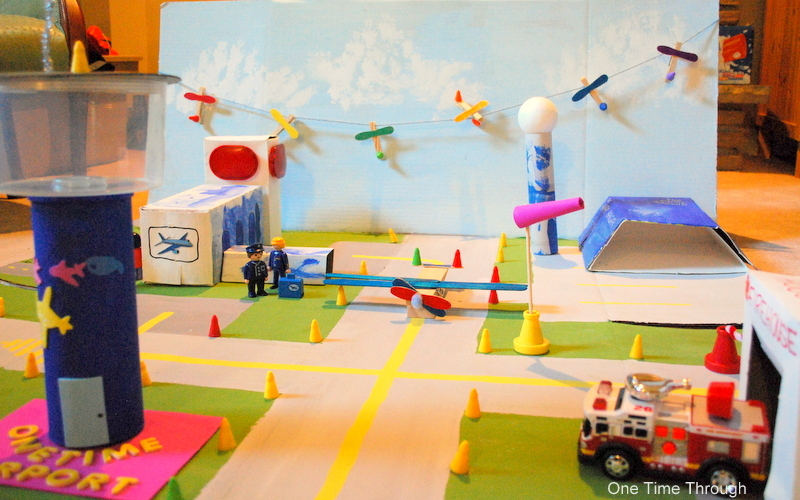 To make the radar tower, I just hot-glued the foam ball to the top of Onetime’s wonderfully decorated paper towel roll! If you want to add a string to attach Clothes Peg Airplanes so they look like they’re flying through the sky, just tape a long blue piece of yarn to both sides of the “sky.” Onetime really enjoyed clipping these little Mini-Planes onto the string while working his fine-motor skills! That’s all folks! 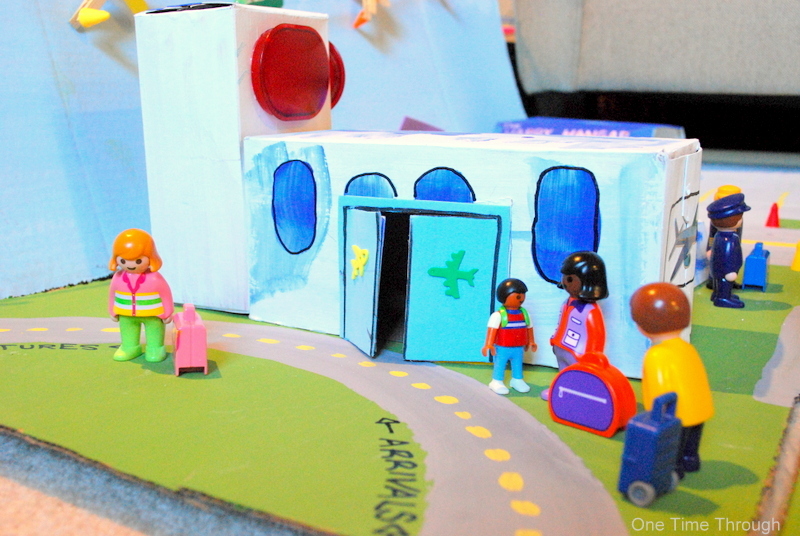 Hopefully you will be inspired by our AIRPORT fun to do some building with cardboard boxes with your little ones! If you’re looking to make the cute Clothes Peg Planes shown at this airport – check out that post here. Wow – I love all the details and all the repurposing! 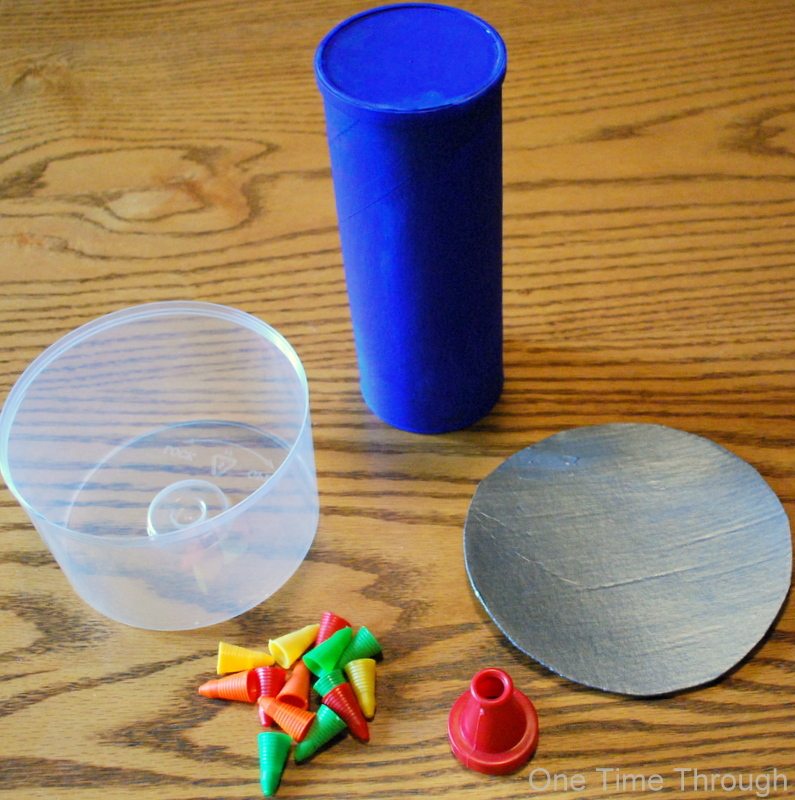 This looks like a ton of fun to make AND play with!